Boxed set. Like new in original packaging. Never used. 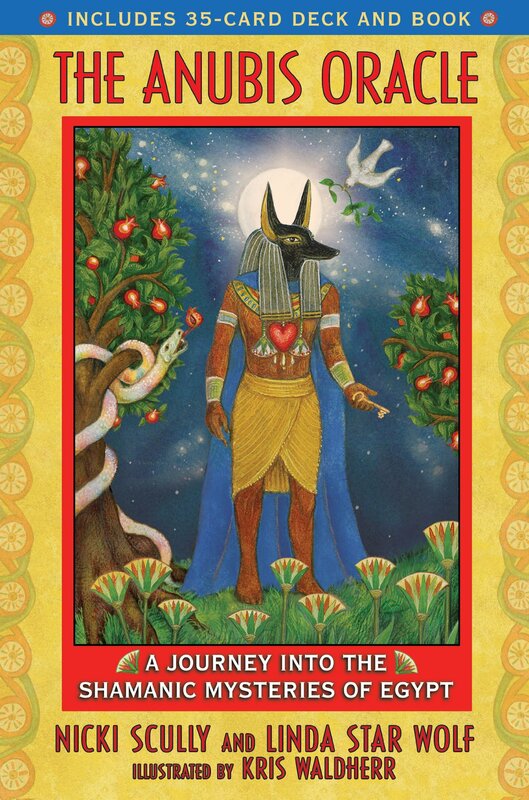 The Anubis Oracle is a guide to the inner workings of the soul. It is also a guide to Inner Egypt and the shamanic mysteries of Egypt that live within us. Inner Egypt is a place of mystery, roots, ancestral wisdom, and love-home of the neteru, the deities of the Egyptian pantheon, who can guide us to the answers we seek today in our personal lives and our outer world. The full-color deck contains a Key Card, a card for each of the 22 deities and 4 elements, and 8 composite cards that portray several deities together. These composites represent 8 major portals of initiation and complex archetypal relationships. The accompanying book provides detailed interpretations for each card and instructions for 8 divinatory spreads that include entering into the mystery, achieving higher love and wisdom, and identifying our sacred purpose. By divining with the neteru, the shaman within awakens. This allows the neteru to reveal the answers we seek in our personal lives and in our interactions with the world by connecting us with the wisdom, guidance, and shamanic mysteries of Egypt that live within us. Many cultures and traditions have used oracular devices such as cards, shells, corn, stones, bones, water, mirrors, and a myriad of other tools to elicit a response from spirit. Tarot is a modern interpretation of the ancient oracle that connected the ancestors to the divine original source. Although here we sometimes use the language of tarot, the Anubis Oracle is an emerging new form that is more closely related to an ancient pre-tarot paradigm. This oracle is an elder of modern-day tarot. The Anubis Oracle is a companion to the recently released book, Shamanic Mysteries of Egypt, Awakening the Healing Power of the Heart. Both contain stand-alone information about the ancient neteru of Egypt, and each offers a unique set of direct experiences related to the Egyptian mysteries. Shamanic Mysteries of Egypt is a series of rites of passage that help us remember our true nature as divine humans with sacred purpose. It provides rituals, meditations, and rites of passage that allow the reader to meet his or her personal and planetary challenges with grace, wisdom, and love. The shamanic initiations provided are invoked, directly experienced, and transformed into embodied wisdom that awakens consciousness and illumines the intelligence of the heart.